All good sandwich begins like this, bread and peanut butter. This one is different though, the circular patch of peanut butter is ready to accompany a meaty counterpart. Bison and turkey are my favorite burgers for this recipe but pork, chicken or tofu would be excellent too. Top it off with caramelized bananas and you’ve got a feast fit for a king – THE king. Elvis would be proud. How good is this burger? Check out the picture below and let me know if your glands don’t salivate. 1. Preheat a pan on medium heat. Cut bananas in half and slice lengthwise. Add the butter to the pan to coat it. Place bananas, flat side down, in the pan and sprinkle with the brown sugar. Cook for 2 minutes and flip. Stir the bananas to get the remaining brown sugar and butter in the pan, and let cook for another 1-2 minutes, or until bananas are caramelized on both sides. 2. Form 4 patties from the ground meat, season with salt and pepper. Grill until desired doneness or cook in a pan on medium heat, covered, for 2-3 minutes per side. 3. 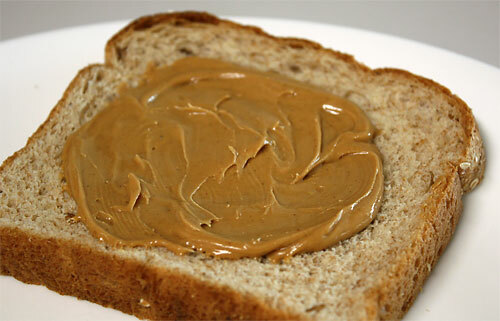 Spread 1 Tbsp of peanut butter on a slice of bread, toasted first if preferred. 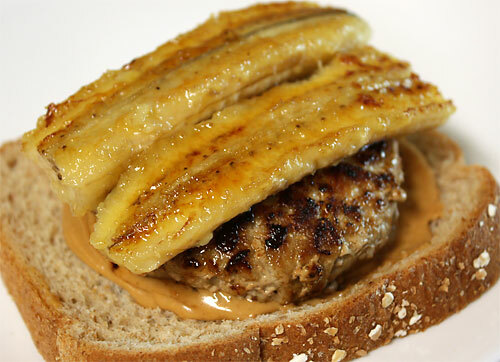 Place burger on top, pile on 2 slices of banana and any additional toppings. Top with remaining slice of bread and consume. Yea, after one bite you’ll be all shook up. Ok, now I absolutely KNOW that your masters program fried your brain. This is nutty. But not necessarily bad! This is the food that fueled me, it has to be good! now you know that is my kind of meal. be not afraid people, try this you will love it. As much as I love peanut butter, I never would have thought to add it to my burger. I think it’s one of those things I think I wouldn’t like, but I would end up LOVING. Thanks for the unique idea. I can see how the peanut butter works, but I’m iffy about the banana. Although, pineapple makes an acceptable burger topping, so perhaps banana isn’t too far off. It’s all interconnected: pork and peanut butter plus peanut butter and bananas equals pork and bananas. Or perhaps think about it cuban style: pork with plantains! This is different. I think it would be best with ground pork. We’ll try it when you come home. WhooHa!!! I’m not a big fan of his music, but I’m a huge fan of his tastes. Add some bacon and honey for a true “kingly” burger. Looks delicious! I bet it’d be great with plantains too. Very true. I’ll give that a shot. Nick! This is wonderful!!!!! I’m all about putting random stuff on burgers: avocados, fried eggs, fried plantains, refried beans, and of course PB! What I had never though of was putting bananas AND pb on a patty. You’re my hero! I remember once I was recovering from surgery and my friend came home and made me the Elvis sandwich (PB, maple syrup and bananas inside. French-toast style. Sprinkled with cinnamon-sugar) and it was the first time I had tried it and, hahaha, I think it brough me back to life! If that doesn’t give you energy, nothing will! No such thing as PB-OD, just terrible stomach aches =). I could see it putting some life back into you, I envision that someday peanut butter will have it’s own section in the food pyramid. Can’t wait to see your entry! Who would have ever thunk it? You’re right, it sure DOES look good! That has to be the most unique burger I’ve ever seen! Yummy. marvelous. inventive. delicious. i’d be such a fan of this, and the caramelized bananas are what makes it completely irresistible. there’s a round of applause coming at ya for this one. Interesting…I’ve got some tilapia in the freezer right now, I’ll give it a shot! If you are willing to try the burger, I figured you wouldn’t be scared of this. It’s awesome! I’m definitely gonna try the burger! I would have never thought of this combination, but it definitely works! Thank you, thank you very much! You’re right, that is one manly burger! It was all going so well until you mentioned the bread. Yours looks brown. You also said gluten-free if need be. Ah yes, well I’m not a celiac myself but I am a health nut. I should have used something fresher and crustier but I’m trying to empty my cabinet and freezers of food before I move in a few days! how would you know what elvis would’ve gone for? you freaking OINKER! I think the takeaway here is not the discussion of “oinkers” but rather that while some people have useful hobbies such as developing, sharing and discussing delicious recipes with family and friends, there are other people, specifically this “mynamehere” character, who spend their free time leaving useless remarks in a cowardly fashion (no name, no email). And while I could simply remove your nearly unintelligible comment, I’d rather keep it up to immortalize your ignorance for the rest of the world Mr. IP Address 72.66.63.97. First, let me say how cute it is that your mom reads your blog!!! That burger looks great. I would add lettuce and sliced tomato. My mom gets angry when her RSS updates stop working on her homepage =). I added lettuce and tomato too, it was great to add some crispness. But the picture of the bananas was much more appealing! R u kidding? Is that really true? I would of never thought to put banana on my burger. I think I would like it, love sweet and savory together. Bacon would be awesome on here. Yes it would! Didn’t have any but I’ll give it a go next round. This truly is one of my favorite ways to eat a burger. I Bet you could even bake a tray of the bananas for a similar effect for ease. Nick, I just noticed I’m on your blogroll. Thanks for putting me on there. That’s awes! Haha, yup. Unfortunately the past few weeks and the next few, I’m so busy that I haven’t been able to visit anyone on my blogroll. That should change soon! Great! I’m so glad you liked it! The more frozen the fruits are, the thicker it will be and the more like ice cream it is. My newest favorite version is to use lowfat cottage cheese (unsalted!). It has a milder taste than greek yogurt and you can add a teaspoon of honey if you need, but it is still plenty sweet enough for me without it. There really is no need for traditional ice cream when you have fresh ice cream at your fingertips, I’m glad you enjoyed it! savoury and sweet huh.. nice! well done nick! I’m so glad the peanut butter is still rolling! love these ideas! Thanks! I’m on streak it would seem…the past 4 recipes have been chock full of the good stuff! That’s a hunka hunka good lookin’ sandwich. I would totally be open to trying that combo! I hear PB and pickles are good too! Wow what a fun idea! I would totally try this with a pork burger. I love the addition of the caramelized banana too. Very nice! What a wonderful way to enter the sweet world of morbid obesity! Ok, honestly, I can’t eat peanut butter but I do love bananas and turkey burgers. I am not sure I would ever think of bananas and a turkey burger but now that you’ve got my mind going it’s reminiscent of a good, Asian stir-fry. Wow. This is something I know that my husband would love – it combines both of his favourite things: meat and peanut butter! do you people SWEAT when you eat? and interesting that elvis is blamed for this fanaticalism.. since the guy was severely allergic to peanuts. hummmmmm. put the fork down, well, if you can’t lift it i guess then this statement fails you. Suprisingly no, I don’t sweat when I eat. In fact, at 6’3″ and 160 lbs I can actually bench press 180 jars of peanut butter at once. Do you know how I know that? It’s complicated math, so stay with me here…. You might have to read through it a few times but eventually it will make sense. But you know what helped me reach a point where I can bench more than I weigh? All the peanut butter I consume. I just saw your site tonight after eating a peanut butter burger at Cheeburger-Cheeburger today. I agree that every good sandwich starts with PB. I’ve put PB on my burgers for 60+ yrs — I may have invented it — I’m talking 1950? I put PB and various cheeses on my burgers, and for the last 20+/- years I’ve added lettuce for ruffage, if available). I eat no “regular” condiments, so PB has always been my condiment (I ate nothing but PB sandwiches at lunch through 12 yrs of public school – ok, pizza in 12th grade on rare occasions). I don’t add bananas (bananas are often mentioned to me when people learn about my PB wierdness — I can go with it but don’t prefer adding fruit). I have many other PB delights. PB on a flour tortilla or good bread with grated parmesan. PB on a tortilla with grated cheese (i.e., a taco mix, a mexican mix, cheddar, longhorn, more) and melted in microwave. PB on many optional different breads, or a torilla, with thin sliced lunch meat beef and parmesan and/or a slice of swiss (or slice other cheese if no swiss in fridge). PB is it! Cool site. Many thanks. How interesting! David, I think you just may have invented the peanut butter burger – perhaps you even inspired Elvis himself! You certainly love the PB and cheese combo. I’ve only done that a few times, but I’m sure you’d approve of my recipes for: Peanut Butter Grilled Cheese and The Jersey Breakfast! this does look good, gonna try one, but this is what killed elvis. so i wouldnt eat to many. Good point. At least I healthified it a little bit! Crap….. not even close. crap I tell you!!!!! I saw a recipe sort of like this. It calls for putting peanut inside the hamburger. Then put cheese on top and finally add a couple of strips of bacon on top of the cheese. That sounds delicious too! I’ll have to try that!